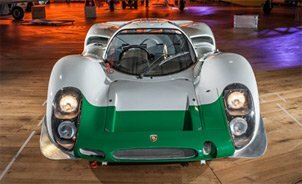 The company PS Automobile GmbH has been trading and restoring historic Porsche vehicles for over 15 years. The owner, Dirk Sadlowski, was actively involved in Porsche motorsport for over 20 years and was privileged to drive fascinating cars such as the Porsche Carrera 6, Porsche 917 Spyder, Porsche Carrera RS 2.7 l, Carrera RS 3.0 l, Carrera RSR, Porsche 934, Porsche 935, 2.5 ST, 2.5 SR and even a 993 Super Cup. He founded the company PS Automobile together with his wife Verena in 1999 and both of them turned their passion into a profession. Two decades of dealing with the famous brand from Zuffenhausen has naturally had an effect on the quality of our range of restored and other vehicles – our passion for Porsche is reflected in every vehicle we offer for sale. Every single vehicle is thoroughly inspected before it is advertised or sold by PS Automobile. All of the axle components, rubber bearings, supporting joints, etc. have been renewed on over 90% of the cars. The complete braking system and the engine and transmission technology are also extensively inspected and properly serviced. Only in this way can a real Porsche also deliver real Porsche driving enjoyment! All of the employees at PS Automobile GmbH have been with the company for many years and are well acquainted with the tasks and challenges set by our customers and these precious vehicles. In our showroom located in the beautiful city of Lippstadt in North Rhine-Westphalia, we always have about 35 historic Porsche vehicles on show that are ready to test drive. No other brand embodies sporty driving or a sporty attitude as much or as consistently as Porsche. And there is no other brand that so fully encapsulates this living tradition. We accompany you “back to the future”.